Mark Morris formed the MARK MORRIS DANCE GROUP (MMDG) in 1980 and the company gave its first concert that year in New York City. The company’s touring schedule steadily expanded to include cities both in the U.S. and in Europe, and in 1986 it made its first national television program for the PBS series Dance in America. In 1988, MMDG was invited to become the national dance company of Belgium, and spent three years in residence at the Théâtre Royal de la Monnaie in Brussels. The company returned to the United States in 1991 as one of the world’s leading dance companies, performing across the U.S. and at major international festivals. Over the past 30 years, Mr. Morris has created more than 120 works for the company. Based in Brooklyn, NY, the company has maintained and strengthened its ties to several cities around the world, most notably its West Coast home, Cal Performances in Berkeley, CA, and its Midwest home, the Krannert Center for the Performing Arts at the University of Illinois in Urbana-Champaign. MMDG made its debut at the Mostly Mozart Festival in 2002 and at the Tanglewood Music Festival in 2003 and has since been invited to both festivals annually. From the company’s many London seasons, it has also garnered two Laurence Olivier Awards. MMDG is noted for its commitment to live music, a feature of every performance on its full international touring schedule since 1996. MMDG regularly collaborates with leading orchestras, opera companies, and musicians. MMDG’s film and television projects also include Dido and Aeneas, The Hard Nut, two documentaries for the U.K.’s South Bank Show, and PBS’ Live From Lincoln Center. The Mark Morris Dance Center in Brooklyn, which opened in 2001, serves as a cultural resource for the community by offering low-cost, high quality dance and music classes for all ages, as well as subsidized rehearsal space for local artists. In addition to the Dance for PD® program, the company offers an innovative arts in education curriculum in the Brooklyn public schools–the Mark Morris Dance, Music & Literacy Project–and provides free community outreach programs for local residents of public housing. MMDG also hosts an annual Open House with a day of free classes for all. 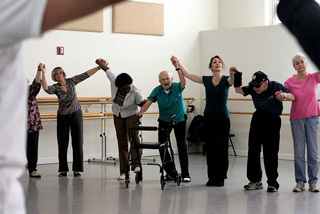 Access/MMDG is a humanities-based program that offers a more complete Dance Group experience by integrating the company’s performances with events and exhibits that draw upon the rich artistic resources of the company. For more information, visit www.mmdg.org. BROOKLYN PARKINSON GROUP (BPG) provides outreach services for the Parkinson’s Disease Center of Excellence at Kings County Hospital/SUNY Downstate Medical Center by promoting awareness of PD in diverse communities and educating health care professionals about PD. The mission of BPG for families affected by Parkinson’s Disease is to develop and sponsor activities that take place in the community, with a focus on the arts. The learning, creativity, and aesthetic enjoyment inherent in artistic endeavors promote physical and mental activity, which are key components of PD care. Activities that take place in non-medical community facilities contribute to a sense of normalcy and ongoing participation in everyday life. Dance for PD, developed in collaboration with Mark Morris Dance Group in 2001, remains the core class for BPG participants. The classes have motivated many BPG participants to be more physically active and engaged throughout the week. BPG also sponsors Sing for PD, PD Movement Lab, and support groups for caregivers and persons with PD. BPG sponsors Fitness for PD sessions in collaboration with Long Island University. For more information, visit www.brooklynparkinsongroup.org.